So earlier this fall, I was going to see some artwork downtown by some of my friends. It was during a gallery walk event, and we were walking down Main Street when I looked over and saw this place called Pre. And I knew nothing about it. I’d never heard of it, and until that moment, I’d never seen it. It looked a little swanky, so I went home determined to learn more about this place. They have a website and a Facebook page, so I was able to learn more about them there. They are still fairly new, to my knowledge. Today, I went downtown with a friend. We were going to eat at Peaceful Greens because I was challenged to go Vegan for a week. (I’m happy to report that I’ve made it half the week, just a few more days and I can return to my normal eating agenda. It’s fun to mix it up once in a while. Another friend wants to try sugar-free for a week, but I don’t think I’m on board with that one.) Anyway, we got downtown to find that Peaceful Greens is apparently gone. I was unaware, so we decided to go give this Pre a try. They are located right at the corner of 8th and Main Street. I was surprised to find them open, only because nobody was in there. And I mean nobody. It was completely empty. We went in and waited for a minute when someone came out and told us to sit anywhere. We did and he brought us some menus and water. The place is really lovely. It’s extremely clean. It’s modern and has a really neat layout. It was really very nice. The menu isn’t expansive, but has some appetizers like wings, chips and salsa, onion rings, and spring rolls. While it’s advertised as Vietnamese food, I’m guessing the starters menu is more for the after hours munchie crowd. They have a list of specialty dishes including Katsu, Vietnamese shaking beef, Vietnamese Sizzling Crepe, Vietnamese beef stew, and a few cold sandwiches as well. 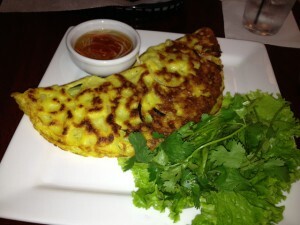 I ordered the crispy tofu and rice noodle dish, and my friend ordered the Vietnamese sizzling crepe. My meal came out in a huge bowl. 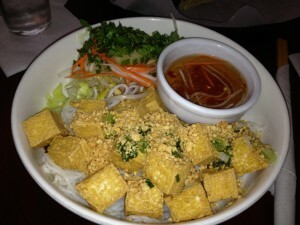 It was rice noodles with shredded lettuce, crispy fried tofu, cucumber shreds, bean sprouts, cilantro, nuts and some kind of gingery dipping sauce. My friend’s crepe was huge, took up her whole place, and was filled with shrimp and bean sprouts, among other things. My friend reported her crepe was tasty, but didn’t care for the sauce that came alongside it. I had the same sauce with my meal, and I really liked it so we can chalk that difference up to a matter of taste. The tofu was good and the overall dish was very pretty. My dish would have been really bland if not for the sauce, so I’m glad that was there. I would definitely like to go back and try a few of the other things on the menu. Our server was extremely friendly. He didn’t hover, but our water glasses never got empty and he was very quick to answer questions and was very polite. Of course, we were the only people in the place, so I’m not sure how it is when it’s busy. Apparently there are parties, music, and djs on the weekends. It looks to be a more trendy nightspot than a lunch spot. Price: Very reasonable for such a trendy place. I paid $10 for my meal and appetizer. The menu is available on their website here.